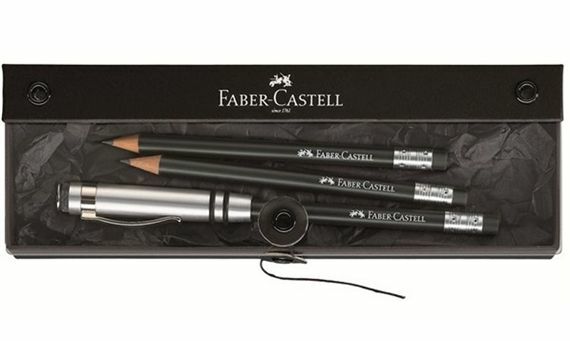 Order your Faber-Castell Perfect Pencil Set today from FahrneysPens.com. Fine Pens, Refills & Luxurious Gifts – great prices & fast shipping. 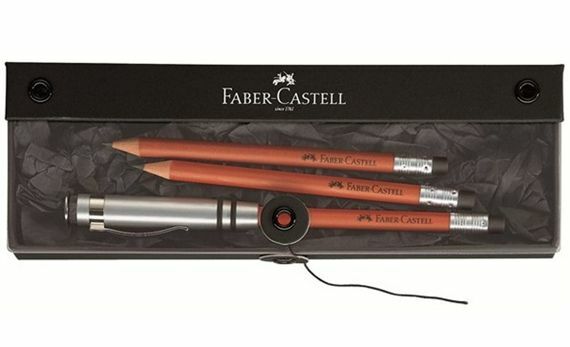 This Faber-Castell Perfect Pencil Set contains 3 pencils and an aluminum pencil extender with a built-in pencil sharpener and metal clip. The pencils contain high-grade B lead and black no smear erasers. The Faber-Castell Perfect Pencil is available in black or brown. The beauty of a pencil is that they can't freeze, making them a smart addition for every day carry. This set is well made. You can use the cap with ordinary pencils, which is nice since the available refills are a little costly. Proper length is about 2 inches less than a standard pencil. The only problem I found is that some pencils don't insert in the cap as smooth as the ones that came with the set, but in that case I just choose a different pencil or cut off the eraser. The sharpener works well, and is available separately so this set up will last for years. Really like this pencil. The fact that it has the built-in sharpener makes it indispensable !! !